A number of AV manufacturers looked to CES to launch new Blu-ray player lines this year, with a total of 16 standalone players announced, alongside two Blu-ray integrated TVs, most with BD-Live capabilities. LG decided to get connected this year with its Profile 2.0 BD370. Not only has the player got BD-Live connectivity, once you hook it up to the net, you can stream content from CinemaNow, YouTube and Netflix. Expect to see the player hit shelves in June. Like its BD370 stable mate, the BD390 offers Profile 2.0 playback and movie streaming from a number of companies. Unlike the entry-level BD370, the 390 offers built-in Wi-Fi and 7.1-channel analogue outputs. The BD390 will also be released in June. Panasonic has added Viera cast to its latest range of Profile 2.0 Blu-ray players, which houses support for Amazon VoD. The BD60 boasts less consumption than its predecessor, the BD35 – 16 per cent less power in standby mode. Unlike the entry-level BD60, The DMP-has 7.1 channel analogue and a playback information window that can be used to display detailed image information while a movie is playing. The BD80 is also Profile 2.0. This is a strange one. The BD70V is the world's first Blu-ray/VHS combi player. There's no recording function on the machine, so quite why they've added the pretty-much defunct video format is beyond us. Panasonic told TechRadar that the machine would be perfect in places like schools. The world's first portable player has a 8.9-inch WSVGA (1,024x600) LCD screen, Viera Cast capabilities, is Profile 2.0 compatible and has bitstream output for Dolby TrueHD and DTS-Master Audio. Battery life is around three hours. Philips announced three new BD players this year. Starting with the HTS-5100B, which is part of a bigger home cinema system. The machine is Profile 1.1, has an SD card slot so you show off your pictures, and will be available in June. The BDP-3010 is also Profile 1.1 player with an SD card slot but will be ready sooner than the HTS-5100B, with an estimated street date of April and a price of $229.99. The BDP-5010 is a Profile 2.0 player that's BD-Live compatible once you have upgraded the firmware via the internet. The 5010 will also be available in April and costs $249.99. The 7310 is Profile 2.0 and offers DivX and WMV playback. The player is Profile 2.0 and is BD-Live capable straight out of the box. Released in May, machine will cost $299. BD-Live capable, the BDP-120 houses 36-bit Deep Colour Support, and audio bistream output of DTS-HD MA and Dolby TrueHD. As with all of Pioneers kit, the machine comes with Kuro link. Price-wise, you are looking at $249 when it ships in April. The big brother of the BDP-120 is Pioneers BDP-320. Landing in shops in April, the machine has 48-bit deep colour support, DTS-HD master and Dolby TrueHD internal decoders, and 7.1 channel outputs. The cost for the player will be $399. Pioneers flagship Blu-ray player, this chunky model for the high-end AV consumer features a Jitter Reduction Circuit, PQLS Multi-Channel output, Kuro link and is fashioned with an aluminium front panel. Estimated street date is April. Price is yet to be confirmed. 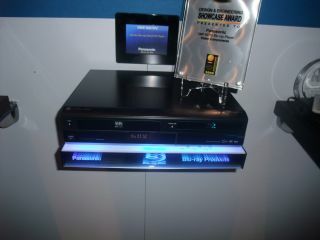 Samsung has really gone town with its new Blu-ray player, making them more stylish than George Clooney at a fashion show. The BD-P3600 has wireless capabilities and can stream to both Netflix and Pandora. The player is Profile 2.0 and boasts Dolby Digital Plus, Dolby TrueHD, DTS-HD HR/MA decoding and audio bitstream output. Expect this one in the shops in the second half of 2009. The beautiful BD-4600 forgoes the table top for a wall-mount. Spinning Blu-rays on their side, the system is one of the best looking players around. Like the P3600, the player is Profile 2.0 and bitstreams a number of audio outputs. Vizio's new Blu-ray player is an affordable way to get you into Blu-ray viewing. Expected to retail at $150, the player offers 7.1 channel output, built-in audio decoding for uncompressed audio formats such as Dolby TrueHD, DTS-HD Master Audio and BD-Live capabilities. The player will be out in stores this April. Alongside its LCD TV integrated with a Blu-ray player (see bellow) JVC announced its debut into the Blu-ray player market – the JVC XV-BP1. The Profile 2.0 player comprises: USB Host, an Ethernet connection for BD Live, component, composite and analogue video outputs.Audio playback includes compatibility with Dolby Digital, Dolby Digital Plus, Dolby True HD, DTS and DTS HD. The player is out in the US in March, costing $299.95. JVC's 42-inch Full HD LCD TV has a built-in Blu-ray player, digital noise reduction, 3x HDMI and has a integrated ATSC-QAM tuner. The TV is expected to land in shops this June. Sharps LCD TV with integrated Blu-ray player is a nice-looking TV that does away with the bulk of a separate BD player. There's Profile 2.0 compatibility on the spinner and the TV features 120Hz refresh rate and four HDMI ports. The TV will be available in 32, 37, 42, 46 and 52-inch screen sizes.